The Giant Siamese Carp is found in the great lakes and remote river systems of Thailand, Cambodia, Laos and Southern Vietnam and is the largest member of the Cyprinidae (carps) family and has been fondly referred to as the ‘Mother of all Carps’. The Giant Siamese Carp in Thailand is a freshwater migratory species which migrates throughout the great river systems of the Mekong Basin and Chaophraya and Mae Klong basin’s attaining astonishing weights in the excess of 300kg/ 660 lb. Sadly specimens of this size are becoming increasingly rare in the fish’s natural habitat due to pollution, over fishing and the introduction of man made dams blocking the monster fish’s migratory routes. The Giant Siamese Carp in Thailand is found in big swirling pools located on the edge of large and wild rivers with the carp occasionally venturing into inundated flood plains, swamps and tributaries to feed and spawn. The Giant Siamese Carp in its wild and natural environment of Thailand’s rivers is believed to live in pairs. Very little scientific information is known about the Giant Siamese Carp’s reproduction habits although juvenile Giant Siamese Carp are annually reported as primarily occurring during the month of October in the Lower Mekong Basin. The Giant Siamese Carp in its wild and natural environment of Thailand’s rivers subsists on a varied diet of algae, phytoplankton, fruit and various other aquatic vegetation in addition to opportunistically feeding on snails, invertebrates and possibly live or dead fish. The Giant Siamese Carp also known as the Giant Barb is the ultimate monster carp species which is indigenous to Thailand surpassing even the mythical Mahseer of India in both sheer size and power. This species of Thai Carp has an enlarged head with a huge cavernous mouth and is listed in various scientific descriptions as not having barbules. Many specimens can be observed to have a minute barb located at each side of its lower mouth. 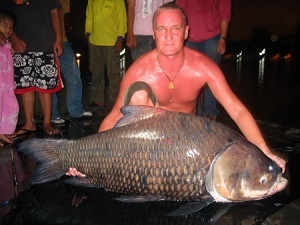 The Giant Siamese Carp has been reported previously at incredible lengths approaching three metres and attaining incredible weights of almost 300 kg’s. Sporting a gigantic rudder-like tail and paddle-like pectoral fins the Giant Siamese Carp is capable of incredible bursts of acceleration whilst allowing the Giant Siamese Carp a high degree of maneuverability. The spectacular size and awesome appearance of this monster carp species is further enhanced by a thick plating of shimmering luminescent scales ranging from dark blue/grey to a rusty bronze colouration in older specimens which cover the carp’s entire body. This amazing monster carp species is an extremely hard fighting fish regaled by international anglers for its fighting qualities with the Giant Siamese Carp characteristically making high speed runs, diving deep and changing direction rapidly. The Giant Siamese Carp in Thailand is renowned for its elusive and wily nature and can be a very challenging and satisfying fish to catch. Giant Siamese Carp although threatened in their natural environment of Thailand’s rivers have thrived in several fishing venues in Thailand reaching incredible weights in the excess of a magical 100kg’s.